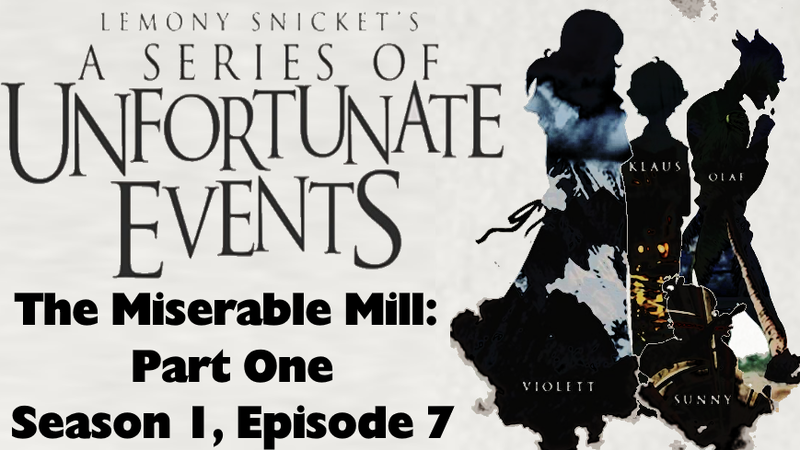 My, oh my, oh me, oh my… talk about an all together different tale, with actual dissension between Violet and Klaus over how to proceed that ends up with dire consequences… following everything we have seen up to this point… for you see, the Baudelaires arrive the Lucky Smells Lumbermill which is run by a gentleman named Sir and his associate Charles who put them to work in the mill for tresspassing and due to the fact that apparently everyone in the surrounding town blames the Baudelaire parents for a fire that wrecked the town (though this is not true, it’s a cover up due to a deal made by Sir to ‘re-write’ history in order to keep the Mill open. But what about the consequences I spoke of? Well Violet and Klaus have two very different points of view of what to do, Klaus just wants to get the hell out of the mill, between the harsh working conditions that make even sweet little Sunny not want to bite things any more (even down she can strip bark off a log within seconds), and the overly happy workers… he’s just terrified and figures it’s best to move on before Count Olaf catches up to them. Violet on the other hand wants to stay and clear their parents name as it relates to the fire that destroyed the town. We see the two of them argue over this point, even with them disagreeing over the foreman of the mill possibly being Olaf, Violet accuses Klaus for not wanting to clear the name of their parents… and he goes off on his own to check his suspicions, however ends up getting his glasses broken in the process. 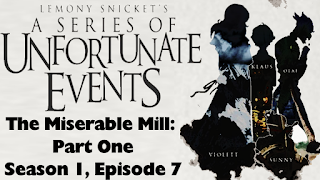 Which leads to the dire consequences, for Count Olaf is in the area coming to the offices / residence of an old acquaintance, an optometrist with just as vile a villainous personality Dr. Orwell. 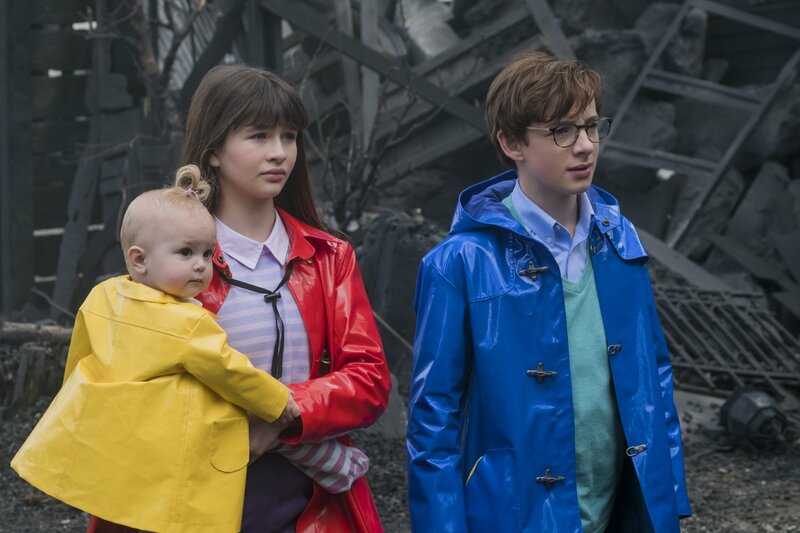 While they did have a bad break up, the promise of striking down the Baudelaires is enough for Orwell to associate herself with Olaf once more and when Klaus is brought to her to get his glasses fixed, she hypnotizes him, turning Klaus into an too willing to work lumber-mill employee to the point it greatly disturbs both Violet and Sunny. The trance does seem to get broken when Violet says she misses him, but the very end of the episode reveals that a new pair of glasses form Dr. Orwell is placed on him. On top of that, it turns out who I thought were the Baudelaire parents, were actually parents of another group of delightful children from down the lane, that of Duncan, Quigley & Isadora … and since I am unfamiliar with the books, I certainly did not see this twist coming… for all this time I was thinking there would be an eventual reunion of the Baudelaire clan, but clearly this is not the case, which leads me to wonder what is special about these three kids and their parents, and what is the connection to the Baudelaires. Now in terms of a standout scene, that I already covered with the discussion of Violet and Klaus’s argument which lead to him being hypnotized, however I will say that Lemony Snicket pointing out directly to the viewer that Mr. Poe was calling around searching for the Baudelaire’s (after getting distracted with clam chowder at the start of the episode) is someone who is of no help what so ever was quite amusing. We also learn that Snicket got into a fight with a refrigerator repair man, who is implied to be the same one encountered by who I thought were the Baudelaire parents.